Allow Change Phase – User can edit the phase that the order is currently in. Allow Fill Back Orders – The ‘Fill Backorder’ button inside the order and on the order list will become available to the user. Allow Increment Phase – User will be able to click the ‘Next Phase’ button inside a sales order or on the sales order list. Allow Returns – Can return items by entering a negative quantity. 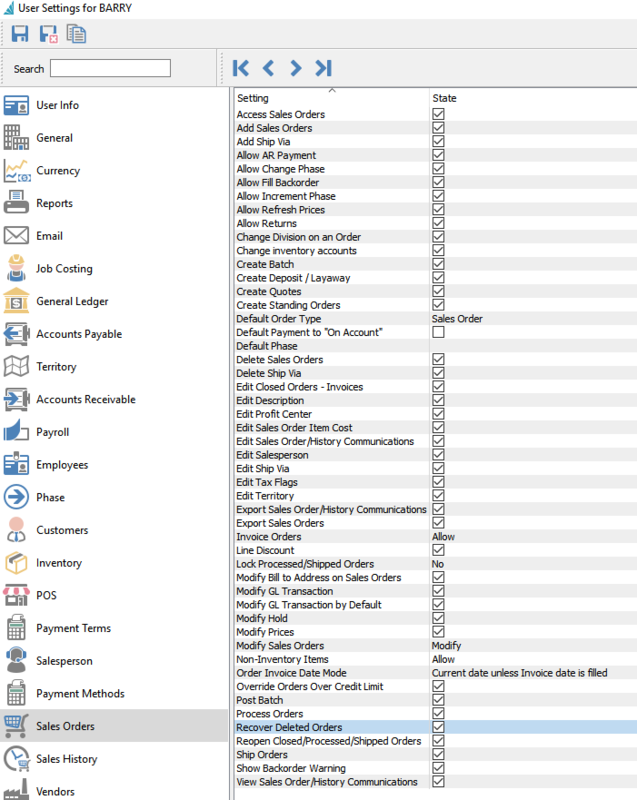 Change Division on an Order – User can switch divisions on a sales order before invoicing. Create Batch – Adds the ability to create batches. Create Deposit / Layaway – Can add a deposit to a sales order. Default payment to ‘On Account’ – User will not be prompted for the payment method. If the customer does not have available credit or is over terms then it will prompt for the payment method unless these 2 settings in Company Settings/Sales Orders/Process-Invoicing are both disabled. Default Phase – When a user creates a sales order this phase is added automatically. Edit Closed Orders/Invoices – User can edit an order even if it is processed, shipped or in the case of batch invoicing, closed. Edit Description – Can edit the default inventory description for a sales order line. Edit Profit Centre – Use is able to change the profit centre on a sales order. Edit sales order item cost – User can edit line by line costs on a sales order. CAUTION – Allowing this setting overrides the cost from inventory therefore putting the GL out of balance with the inventory. Edit Sales order/History Communications – Edit the notes/communications on a sales order and the invoice. Edit Salesperson – If set, the user can change the salesperson code on an order that was previously saved, and edit the default sales person code that came from the customer. Edit Tax Flags – Can edit the taxes charged by overriding the defaults on the sales order. Edit Territory – If set, the user can change the territory code on an order that was previously saved, and edit the default territory code that came from the customer. Export Sales order/History Communication – Export the notes/communications on a sales order and the invoice. Line Discount – User can add/edit the line discount percentage. Lock processed/Shipped orders – If checked, the user cannot edit a processed or shipped order. Modify Bill to address on a sales order – User can edit the bill to address on a sales order before invoicing. Modify GL Transaction – Allows the user to edit the journal entry before posting. Modify Hold – Can change the hold status of a sales order. Override orders over credit limit – If the customer is over their credit limit, the user will be able to override the order and/or edit the customer’s credit limit. Post Batch – Adds the ability to post batches. Process Orders – User can process orders therefore print the picking slip. Reopen Closed/Processed/Shipped Orders – User can right click on an order and put it back to open status. Ship Orders – User can ship an order and print the packing slip. Show Back Order Warning – If checked, the user will be warned that the item was back ordered. If not checked the item is silently back ordered. View sales order/History communications – See the notes/communications on a sales order and the invoice.